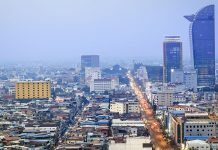 Phnom Penh will face flooding in certain areas in the coming days as the level of the Mekong River surpasses emergency level, while heavy rainfall from tropical storm Wutip, which made landfall in Laos from the South China Sea on Friday, prompted the government to release new flood warnings for 11 provinces. Forty-eight families were evacuated from their homes in Phnom Penh’s Meanchey district on Friday after floodwaters inundated their homes in Chbar Ampov II commune, municipal spokesman Long Dimanche said. “Water from the river has started flowing into parts of Phnom Penh,” he said. “Of course, we are concerned over flooding in Phnom Penh,” Mr. Dimanche said, adding that city officials have prepared sandbags to staunch floodwaters in low-lying areas of the city. On Friday, the Mekong River reached 10.06 meters at the Tonle Bassac-Chaktomuk water station on the city’s riverfront, just below the emergency 10.50-meter level, stirring concerns of further flooding in three districts: Meanchey, Dangkao and Pur Senchey. 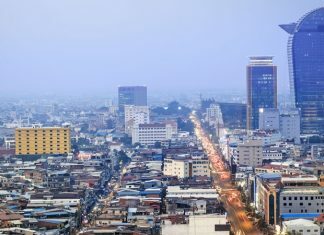 “We are ready to help evacuate and rescue Phnom Penh residents in three possible flooded districts,” Mr. Dimanche said. The Ministry of Water Resources and Meteorology said in a statement on Thursday that tropical storm Wutip would bring heavy rains between Saturday and Tues­day to most of the country, and coastal fisherman were advised to stay on land until Wednesday. “The rainfall mentioned will cause Mekong River flooding again,” the ministry said in the statement, which also called on authorities in affected areas to respond to people’s needs in order to avoid loss of life. The death of a mother and her two young children on Thursday brought to 39 the number of people killed so far by flooding, which has forced almost 6,000 families from their homes and flooded a further 30,000 residences in eight affected provinces: Stung Treng, Kratie, Kompong Thom, Kompong Cham, Kandal, Banteay Mean­chey, Oddar Meanchey and Preah Vihear. In Ratanakkiri province, 24-year-old Srey Noy died along with her two sons, 2 and 4 years old, when the motorcycle on which they were traveling drove into a deep ditch that was submerged by flash floods in Kon Mon district’s Ta Ong commune. 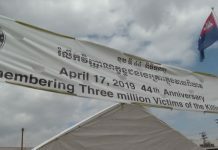 Three more people drowned Friday, two in Kratie and one in Kompong Cham, said Keo Vy, deputy director of the information department at the National Committee for Disaster Management. In Kratie province, flooding from the Mekong River cut off access to some 30 km of National Route 73 between Chhlong district and Kratie City on Wednesday, and on Thurs­day, flooding closed off Road 371 between Chhlong and Kompong Cham province, said Sreng Sros, deputy director of the Kratie provincial department of public works and transportation. Both routes are under 30 cm of water. A 500-meter stretch of Road 377 in Kratie’s Sambor district has also been impassable since last weekend but motorists heading to the northeast can still travel between Kompong Cham and Kratie via National Route 7, Mr. Sros said. Khoy Khunnhor, chief of cabinet of Preah Vihear province, said that the province declared an emergency on Friday when the Stung Sen River reached 11.76 meters, far above the emergency level of 10.50 meters. “Three districts and the provincial capital in Preah Vihear province have been affected by flooding,” said Mr. Khunnhor, adding that hundreds of families have been evacuated to higher ground.